In spite of the presence of numerous cardrooms inside MS casinos, you might find it preferable to play Mississippi online poker. You can log in from your computer at any hour of the day or night and feast your eyes on the wide range of stakes and formats being dealt. The convenience of online poker in Mississippi sure beats the uncertainty involved in heading to your local brick-and-mortar poker room and hoping that the type of game you want to play is actually running. You might have heard that online poker is illegal, but this isn't true. There are no federal laws prohibiting anyone from playing in card games over the internet. The Wire Act used to be used by the authorities as a justification for attempting to shut down online poker sites, but in 2011, the Department of Justice released an opinion that stated that the Wire Act only applies to wagering on sports outcomes, not to poker or other forms of real money gaming. 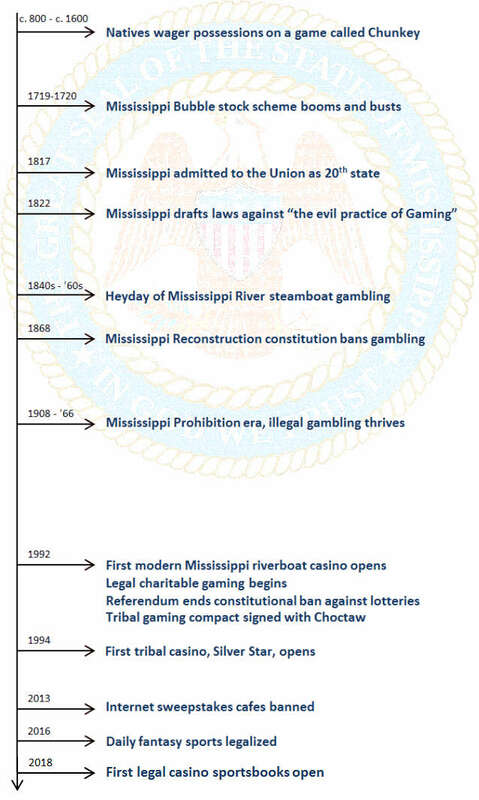 The State of Mississippi's anti-gambling laws have their origins in dusty, old statutes passed before the 20th century even began. No law enforcement officials have ever attempted to employ them to go after online poker players, and there has never been any arrest of an MS citizen for participating in poker games conducted online. You're perfectly secure, from a legal standpoint, if you wish to compete against your peers from all over the world at the virtual card tables. We've gathered together a ton of information on the outstanding sites for MS online poker, the bonuses and promotions that are available, the history of gambling in the state, any laws that might be relevant, and a whole lot more. Keep reading to educate yourself on your options for online poker in Mississippi. 13. Address in Nearby State? The online poker landscape is mostly inhabited by providers that are reliable and honest. However, there are a few shady sites that might not care much about safety of your money and the fairness of the games. In order to protect you from possibly playing at a disreputable poker room, we've gone to the trouble of researching the online sites that serve Mississippians, and we've narrowed them down to a shortlist of trustworthy operators. No matter which of our recommended internet poker rooms you sign up for, you'll be treated to attractive and functional software, aboveboard gameplay, and the speedy payout of any winnings you earn. Anyone looking for online poker in Mississippi would be wise to keep Ignition Poker on his or her radar because it's the most popular such site in existence. Newcomers are entitled to claim a 100% up to $1,000 poker bonus on their first deposits. The bonus is equal to 30% rakeback in tournaments and sit n' gos while being worth slightly less in ring games. Cash game poker is present at Ignition at stakes ranging from $0.02/$0.05 to $10/$20 for NL Texas Hold'em, PL Omaha, and PL Omaha-8. Limit poker aficionados are also looked after well here because LHE and LO/8 are listed as high as $30/$60. There's a form of ring game poker here that you may love if you're a bonus hunter or a fan of quick-moving action: Zone Poker. This fast-fold poker variant lets players fold and immediately move to a new table with another set of hole cards. Because there's much less waiting around than in normal poker, it's possible to see many more hands within the same timeframe as you would at a regular cash game table. Sit and goes are denominated from $1 + $0.05 to $200 + $14. There are a few interesting formats besides the regular SNGs that you'll see at many other sites. Beginners contests reward a larger fraction of the field than is standard. Triple Ups allow one-third of the participants to walk away with a prize of three times the buyin. In late 2017, Ignition added Jackpot Sit & Go, which is a three-handed game that chooses the prize pool via random mechanisms. You could find yourself playing for 1,200 times the amount you paid to enter if fortune is with you. There's more than $1.5 million in guaranteed MTTs every week. The biggest one is the $150 + $12 $100,000 Guaranteed, which takes place on Sundays. From time to time, Ignition hosts tournament series that pay out millions of dollars in prizes. These include the Black Diamond Poker Open and the Golden Spade Poker Open. Ignition and the rest of the rooms on the PaiWangLuo Network operate according to a recreational player model. As part of this model, all players remain anonymous at the tables and are identified solely by a player number, e.g., “Player 1,” “Player 2,” et cetera. Longtime poker professionals sometimes bemoan the fact that this way of doing things makes it impossible for them to use their sophisticated player tracking tools, but casual users prefer things this way. The main effect of the anonymized games has been that novices feel comfortable here, leading to very soft games. Ignition provides download installers for both Windows and Mac. Additionally, there's a web poker app that works with phones and tablets. If you're eager to sample as much gaming as possible from your mobile, then you may wish to head over to the attached casino. You can enjoy hundreds of games, and you'll even get a 100% up to $1,000 bonus to try them out. Create your Ignition Poker account today by following the link above. You may also wish to peruse our comprehensive Ignition Casino Poker review for further information. Sportsbetting.ag is one of our highly rated rooms on the Chico Poker Network. Besides poker, it also offers up thrilling casino gaming, sports betting, financials, and other wagering platforms. As a new player, you'll be able to score a 100% up to $1,000 bonus for poker, which clears at a solid 20% rate. No Limit Hold'em, Pot Limit Omaha, and Pot Limit Omaha-8 await you at blind levels between $0.05/$0.10 and $5/$10. Additionally, there are a couple of high-stakes NL Texas Hold'em tables at $10/$20. At certain specially labeled NLHE tables of $0.50/$1.00 and above, there's a Bad Beat Jackpot that's active. When triggered by someone taking JJJJ or better to showdown and losing, it distributes its contents to the entire table. In the past, this jackpot has been hit for close to a million dollars! Boost Poker is a fast-fold variant, but it's only offered at a single $0.05/$0.10 level. Sit-and-goes are particularly popular at SB.ag. There are games listed from $1.05 all the way up to $200 + $15. Most levels below about $200 are pretty active, and you won't have to wait more than a few minutes to get action. The addition of Windfall Poker in December 2017 brought lottery-style SNG to the Chico Network for the first time. The size of the prize pool is governed by a multiplier dice roll, and the biggest contests award money equal to 2,000 times the buyin. Sadly, things aren't as bustling on the multi-table side of the fence. Most MTTs have buyins of $33 or less and come with fairly small guarantees. The Sunday Main Event is the exception. It costs $90 + $9 and awards no less than $50,000 to the victors. On the last Sunday of each month, these figures increase to $100 + $9 and $100,000 respectively. It's possible to log into the Sportsbetting poker room from either a Mac or PC because there are dedicated clients for both types of machine. There are also mobile apps for iOS and Android, and you can use them to access almost the entire range of games that are available on the desktop version. A web browser poker client also exists, permitting you to play without having to download anything. We've reviewed the SB.ag mobile poker app, and we believe it to be one of the easiest-to-use mobile poker solutions out there. No matter what form of poker you play, the Chico Network has ways of rewarding you. There are leaderboards every day for cash games that are good for a total of $1,100, split up among various blind level divisions. Also, SNG fans have the chance to scoop up a piece of $5,275 each week in the Sit & Go Challenge. Furthermore, you'll collect comp points as you play, and they can be exchanged for tournament buyins at a rate of about 5% valueback. Reload bonuses are somewhat frequent, and they release at the same rate as the initial deposit deal. Click on the above banner to visit Sportsbetting.ag today. We've prepared a detailed Sportsbetting.ag Poker review so that you can learn more. SB.ag has a sister site with the same games and poker welcome bonus, and you can read about it in our review of BetOnline. Bovada is a sister site of Ignition and it therefore shares the same PaiWangLuo tables and tournaments. However, the gambling platform at Bovada is superior because it contains a sportsbook and a racebook, both of which are absent from Ignition. On the other hand, the poker bonus is inferior, being only a 100% up to $500 match as opposed to the $1,000 that's available at Ignition. The selection of sports that you can bet on is vast. It includes all the popular USA sports, like baseball, basketball, and football, but there's also a fairly decent lineup of contests from around the globe too, such as golf, tennis, and soccer. Through the Live Betting section of the website, you can make further wagers even after games have already started. New players can pick up a 50% up to $250 sportsbetting bonus. This doubles to a maximum bonus of $500 if you elect to use the digital money Bitcoin. As an adjunct to the sportsbook, the racebook is compatible with the same bonus deal, so you can bet the ponies to clear these extra funds if you wish. There are about 200 tracks listed with the majority being in the United States. Straight wagers and exotics are both on the menu, and you'll receive full track odds when you bet at Bovada. The casino at Bovada is basically the same as that at Ignition Casino, but there are a few additional features here. A series of casino leaderboards runs every day so that you can compete against other users to get to the top of the standings. Each contest only pays out a small amount of bonus money, but they don't cost anything extra to join, and their running times are well under an hour. You'll also get the opportunity to enjoy Live Dealer games, which combine the live and online casino experience by having a human dealer operate the gaming apparatus with the results shown on your computer through a real time video feed. Casino mavens get a 100% up to $1,000 bonus at Bovada, and it's usable up to three times for a total of $3,000 in free cash. Bitcoin lovers instead get three 150% up to $1,500 bonuses, for up to $4,500 on the house. It's simple to create a new Bovada account by clicking the above link. To familiarize yourself further with the gambling offerings first, read our comprehensive Bovada Poker review. Intertops has been in the business of accepting wagers from customers for more than 30 years. That's right; the inception of this firm dates back before the online gambling industry was even created because it was an offline bookie first. It jumped onto the internet ahead of most of its rivals, and it now maintains a sportsbook, several separate casinos, and a poker room. You'll get a 200% up to $1,000 poker bonus when you register your account and make a deposit. The welcome bonus at Intertops delivers its value according to a complicated formula, but it can approach 27% rakeback equivalent. As a reader of Professional Rakeback, you'll also obtain 36% dealt rakeback standard when you sign up through our links. As a further enticement to new customers, the site also grants 50 free spins to use in the attached casino. Finally, you'll receive a ticket to the monthly $1,000 depositors freeroll. The Horizon Poker Network, of which Intertops is the flagship, is a smaller poker operation. Therefore, you won't see tons of tables going at the same time. You should have no problem jumping into a game of $0.25/$0.50 NLHE or lower whenever you feel like it, but if you play for higher stakes, then you'll only sporadically find a matching table. The SNG lobby is virtually deserted above the $5 buyin level. The multi-table tab of the poker lobby is better, though, because there are dozens of tourneys held every day. The most notable of them is the Sundowner, which runs three times a day for an entry of $16.50 and guarantees $1,000. On Sundays, the price of the Sundowner climbs to $27.50 while the guarantee is boosted to $4,500. Ongoing promotions are numerous at Intertops. There's a $4,000 rake race each week, and it rewards the top 100 finishers. A Loyalty Levels program hands out complimentary goodies as you reach certain point totals, and the gold chips you earn while playing can be traded in for no deposit bonuses. Reload bonuses are also common, and you'll be able to take advantage of them about once a month. Several times per year, Intertops holds online satellites to fun live poker events. Overlays are not unknown, so you can win a dream poker vacation for a fraction of the regular cost. Follow the banner link above to go to Intertops and sign up. For more on this poker site, consult our review of Intertops Poker. As its name implies, Americas Cardroom is one of the leading destinations for online cards in the United States. It and its Winning Poker Network partners have the second-highest traffic numbers of any site in the market. When you fund your account for the first time, you'll be credited with a 100% up to $1,000 bonus and $50 free to use on the games. The bonus clears at a 20% rakeback rate. The cash game lobby at ACR contains NLHE, PLO, and PLO/8 at levels from $0.01/$0.02 to $25/$50, and even the highest games sometimes start. If you prefer fixed-limit variants, then you'll be able to take a seat for LHE, LO8, Seven Card Stud, and Seven Card Stud/8 at blind levels as high as $30/$60. In some cases, there are even bigger games spread. The sit-and-go selection at Americas Cardroom includes Jackpot Poker. It's a type of lottery SNG in which the prize pool is determined by a randomized multiplier that can be as much as 2,500 times the buyin. SNG 2.0 is another format that incorporates random features to increase the prize pool. Apart from these rather unique competitions, you'll encounter normal SNGs that cost just a few dollars as well as those that require buyins of more than $1,000. If you like multi-table tourneys, then you're in luck. There's a weekly Sunday Major called the Sunday Special that's priced at $200 + $15 and pays out at least $150,000: enough to make it the largest weekly tournament open to players from the United States. Every once in a while, ACR holds a $500 + $40 Million Dollar Sunday, allowing you to contend for your share of the seven-figure prize pool. There are also many tournament series, like the Online Super Series, that let you square off against thousands of opponents for the opportunity to win a massive payday. Cash game enthusiasts at ACR can try to place atop The Beast weekly leaderboard while those who engage in regular SNG play can compete in Sit & Crush. Both of these promotions distribute tens of thousands of dollars in cash and satellite entries per week. Even if these leaderboards don't fit your pattern of play, you can still rack up rewards with the Elite Benefits program, which pays off depending on the amount of Combat Points you collect through playing poker. Register for Americas Cardroom today by clicking on the above link. You can read our ACR Poker review if you wish to apprise yourself of what to expect. Americas Cardroom is a member of a poker network, which means that it cooperates with several other organizations to enhance its poker product. Other prominent names on the Winning Poker Network are: BlackChip Poker (read review) and True Poker (read review). It's possible to acquire rakeback on any of these rooms. To find out how, browse over to our Winning Poker Network rakeback instructions page. 5Dimes has been a trusted name in online bookmaking and casinos for a while now, and it added an in-house poker product to its portfolio in 2014 with the creation of the Grand Poker Network. This poker room can be logged into from computing platforms using Windows, MacOS, iOS, Android, and several other operating systems because many separate versions of the software have been developed, including a Flash app that works with any modern web browser. The player volume at 5Dimes is a bit underwhelming, which is only to be expected from such a new poker site. It might be better to reserve this room as your backup site and select another as your main poker home. Still, there are plenty of reasons to play at 5D, including the fact that most of the people at the tables are clueless when it comes to poker strategy. A majority of them have come over from the casino and sports divisions and are just playing a few card games for fun without really knowing what to do. You can attempt to grow your bankroll at their expense at NL Hold'em tables from $0.05/$0.10 to $1/$2. Tournaments also represent a fine avenue for increasing your profits in spite of the smallness of the games – no MTT buyin exceeds $5 + $.50. Every day, there are a few tourneys that charge NO HOUSE FEE. Also, there's a weekly Sunday freeroll with $500 up for grabs and usually only a few hundred competitors. Both of these features make 5Dimes an excellent place for any aspiring tournament grinder. The 50% rakeback that all ProfRB visitors are entitled to doesn't hurt either and is applicable to cash games as well as tourneys. Signing up for 5Dimes is easy – just click through the above banner. Our Grand Poker Network review contains a lot of info about the network on which 5D is housed. ◆ If you want to be able to choose from the broadest array of active games, then Ignition, Bovada, and WPN have the most tables to select from. ◆ If you're looking for a profitable welcome bonus, then the Horizon Network's 200% up to $1,000 special ought to leave you happy. ◆ If you like casino games and sports betting in addition to poker, then Chico, Horizon, Bovada, and Grand are all reasonable solutions. ◆ If playing from a Mac or mobile appeals to you, then Chico, Ignition, Bovada, and Grand support the cross-platform gaming you seek. ◆ If you have your heart set on acquiring a rakeback deal, then Winning's 27% and Horizon's 36% offers should please you. ◆ If you believe you deserve recurring rewards as you play, then WPN's Elite Benefits and Horizon's Loyalty Levels might be right for you. ◆ If you appreciate unusual styles of gameplay, then you'll find several non-standard formats at Ignition, Bovada, and WPN. When you're ready to request the payout of your winnings, all of the sites described above are willing to send a check to your address. At some of them, other cashout methods may be available, like bank wires and money transfers. We advise our readers to transact in the digital currency Bitcoin, which is possible at every internet poker site we work with. Bitcoin lets you avoid the fees and delays that are sometimes associated with other methods of withdrawing your funds. If you're keen to begin using Bitcoin but aren't really sure how to do so, please read our guide to Bitcoin for online gambling. Except as otherwise provided in Section 97-33-8, if any person shall encourage, promote or play at any game, play or amusement, other than a fight or fighting match between dogs, for money or other valuable thing, or shall wager or bet, promote or encourage the wagering or betting of any money or other valuable things, upon any game, play, amusement, cockfight, Indian ball play or duel, other than a fight or fighting match between dogs, or upon the result of any election, event or contingency whatever, upon conviction thereof, he shall be fined in a sum not more than Five Hundred Dollars ($ 500.00); and, unless such fine and costs be immediately paid, shall be imprisoned for any period not more than ninety (90) days. This seems fairly all-encompassing and, according to the letter of the law, would make poker illegal. There's a weird carve-out for dog fights, and there's a list in the next few paragraphs that exempts gambling conducted on cruise vessels and other activities that are specifically authorized by other statutes. A FAQ on the Mississippi Gambling Commission's website states that it's illegal to play poker within the state anywhere other than a casino and that “internet gambling is illegal,” so the MS officials definitely believe that online poker is contrary to the law. The penalty for illegal gambling is just a fine of $500 although there is a slim possibility of imprisonment for up to 90 days in the event that someone convicted does not pay up “immediately.” Curiously, there's an additional fine described in 97-33-5 whereby anyone who wins at gambling has to forfeit the amount won over to the court. It's pretty good to know that the standard punishment is only a fine, but things get even better when we look at how law enforcement actually applies the law. There's no record of any online poker player being arrested or charged under the gambling laws in Mississippi. This means you're totally safe, from a legal standpoint, if you want to play cards over the internet. Perhaps the police and prosecutors know what the Gambling Commission has forgotten or doesn't wish to admit: The text of 97-33-1 has its origins in a bill passed in 1898 although it has been adjusted slightly over the years. It's possible that the statute wouldn't hold up in court, especially as regards online poker, because of the legal doctrine of desuetude. As contrasted to the laissez-faire attitude displayed by the Mississippi authorities toward individual players, there's quite a slew of provisions on the books targeting those who actually run the games. Owning a gambling device, operating an internet sweepstakes café, keeping gaming tables, permitting gambling on premises, pool selling, and putting up a lottery are just a few of the activities deemed contrary to the law. Most of the punishments doled out for these violations are small fines or short stints in jail; however, a few of them carry the risk of years of imprisonment and/or thousands of dollars in fines. The most severe consequences come for those found guilty of managing a lottery – they can face up to five years' imprisonment. The online poker rooms that serve the United States don't seem too concerned about these punitive measures, and they all happily accept Mississippians. No doubt their legal teams have advised them that they have little, if anything, to worry about with the MS legal situation. Mississippi has seen its fair share of gambling even during prehistoric periods. The indigenous Mississippian Culture flourished from about the year 800 until its decline around 1600, and it spread not just throughout what's now called Mississippi but also east to the Atlantic Ocean and north to the Great Lakes. The game of chunkey held great social and religious significance, and fortunes were sometimes wagered on the outcome. It involved rolling a rounded stone along the ground and throwing spears to try to come as close as possible to the stone's final resting spot. Modern research suggests that chunkey even served to encourage the movement of goods, which would otherwise have been difficult due to the lack of common mediums of exchange. By gambling for merchandise, items could be redistributed to various groups more or less fairly even when their economic circumstances would have made regular trade impractical. After the disappearance of the Mississippian Culture, successor tribes, like the Chickasaw and Choctaw, continued to enjoy chunkey-derived pastimes. Although the Spanish were the initial Europeans to set foot in the territory, the first settlements were erected by the French at the end of the 17th and beginning of the 18th centuries. This French presence on the continent touched off a form of gambling that became increasingly common in the following centuries: betting on shares in companies. The Mississippi Company was purchased in 1717 by Scottish economist John Law who had managed to finagle himself into a high financial post within the French monarchy. The Company was granted a monopoly on trade in Louisiana (which included areas now part of Mississippi), and its share price rose spectacularly from 500 livres to 15,000 in 1919. Unfortunately, this growth wasn't driven by profits but rather by overzealous marketing practices, the issuance of far too many shares, and the printing of bonds, which were often exchanged for company shares. The entire enterprise ended in collapse when the overheated, speculative economy surrounding it led to rampant inflation while the promised trading profits in Louisiana never materialized. 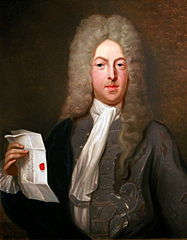 John Law had to flee France in disgrace, and company creditors eventually received small fractions of what their shares had been worth on paper. Interestingly, John Law was noted as a successful gambler and one of the few at the time to study probability in order to swing the odds in his favor. Perhaps he would have done better to devote himself exclusively to the gaming tables rather than to the uncertainties of politics and finance. Early pastimes among the French residents of Mississippi included checkers, billiards, and cards, and they often wagered on them. Later on, horse racing took hold as evidenced by the completion of the Fleetfield Race Track at Natchez in 1795. Toward the end of the 1700s and beginning of the 1800s, parts of this land were disputed and transferred several times among Spain, France, Great Britain, and the United States. In 1812, the borders of Mississippi were finally settled at their present locations, and it became the 20th state in 1817. The new legislators wasted no time in drafting laws against gambling. In 1822, “An Act to Reduce into one Act the several Laws to Suppress the evil practice of Gaming” was passed. It made gambling debts unenforceable, prohibited gambling in public places, provided for the seizure of money used in betting, and punished cheating. Notwithstanding the attempts of the authorities to clamp down on real money gaming, there soon appeared a venue for betting that they had little control over: riverboats. These speedy watercraft plied their trade up and down the Mississippi River, and they were under the effective jurisdiction of states only when they docked at port. While traversing the waterways, passengers could and did play betting games. 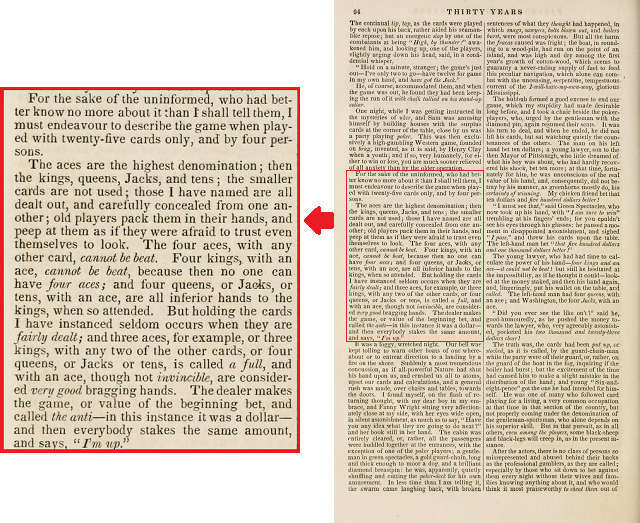 The earliest recorded mention of poker anywhere has it taking place on just such a vessel in 1829. At this time, the game was played with a stripped deck consisting only of tens and above, and there was no draw. Within a few years, however, a normal 52-card deck was used, and people were allowed to discard and draw new cards a single time. Five card draw had come into its own and remained the premier poker variety for the rest of the 19th century. Description of an 1829 Poker Game by Joe Cowell in His "Thirty Years Passed Among the Players in England and America"
The gambling scene spilled over into port towns along the river, like Natchez and Vicksburg. However, the citizens of these towns looked unfavorably on professional gamblers. On July 5, 1835, the residents of Vicksburg passed a resolution that all professional gamblers had to leave town within 24 hours. Some of those targeted refused to flee, but a committee of vigilantes busted up their places of business and hanged five of them. Natchez made a similar decision later that same month, and this time, the gamblers left quietly, no doubt with the example of Vicksburg fresh in their minds. A similar provision was carried forward into the 1890 constitution, which is the one that's still in force today. For most of Mississippi's history, this was interpreted as a blanket ban on gambling of all types although the state's Supreme Court later decided in a 1990 case that the word “lottery” was not equivalent to “gambling.” Regardless of their perceived illegality, there was still a demand for betting services, and gambling houses throughout Mississippi continued to happily accept action from members of the public. The Prohibition era in Mississippi lasted much longer than it did in the rest of the United States, spanning from 1908 to 1966, but there were always ways around it. One of the hotspots for illicit booze was called the Gold Coast, and it was located across the Pearl River from Jackson. In addition to alcohol, patrons of several underground establishments could sample dice games, blackjack, and of course poker. There was also first-rate entertainment, mostly jazz, including performances by such luminaries as B.B King, Duke Ellington, Ella Fitzgerald, and Louis Armstrong. There were crackdowns against illicit gambling parlors in the '50s and '60s, and so the clubs in the Gold Coast and other similar locations across the state had to close down. Mississippians had to endure an unsatisfying real money gaming situation for several decades before legislation was passed in 1990 allowing riverboat casinos. 1992 was a banner year for gaming firms and individual bettors alike as several desirable developments occurred. The first river-based casino opened for business: the Isle of Capri in Biloxi. Also, a Charitable Bingo Law was enacted that legalized bingo and raffles for qualifying organizations that obtain the appropriate licenses. Furthermore, the state signed a gaming compact with the Mississippi Band of Choctaw Indians, the only federally recognized tribe within MS borders. Finally, a referendum to remove the constitutional injunction against lotteries passed. Unfortunately, despite many attempts in the intervening years, the legislature has not yet managed to approve any bill setting up a lottery. In 1994, the Choctaw inaugurated the Silver Star casino in Philadelphia, Miss., and have since added a couple more locations to their portfolio. In the wake of Hurricane Katrina in 2005, the state relaxed the rules governing riverboat casinos on the Gulf Coast and allowed them to be built up to 800 feet inland. Today, most of these venues resemble normal brick-and-mortar casinos because they're allowed to remain permanently docked, and anyway, the bodies of water upon which they've been constructed are often small and invisible to the naked eye. In 2013, internet sweepstakes cafes were prohibited. In May 2016, Governor Phil Bryant signed SB 2541 into law, making daily fantasy sports legal in Mississippi. In 2017, the legislature passed a law legalizing sports betting, but it didn't come into effect until the Supreme Court's Murphy decision in May 2018 removed the federal prohibition on betting on sports. After just a few months to get the appropriate gaming regulations drafted, the first Mississippi legal casino sportsbooks opened for business on Aug. 1, 2018. With a thriving live casino economy, Mississippi seems to be a favorable candidate for a legal internet gaming framework. Indeed, in the years 2012 - 2015, State Representative Bobby Moak introduced legislation that would create a regulated MS online poker environment. All of these attempts have faltered, and since 2015, no new bills have been introduced to make internet card games explicitly legal. The conservative political nature of the state makes it somewhat unlikely that there will be much movement in this direction anytime soon, but we wouldn't be surprised to see it eventually happen. After all, there's now legalized sports betting within the state albeit live rather than online. If and when regulated internet poker comes, it's highly likely that Mississippi would have to sign interstate compacts to create a viable market because its population (about 3 million) would probably not be sufficient to support an independent user base for poker online. Mississippi is a mixed bag when it comes to offline betting. There's no state lottery, and pari-mutuel wagering is not permitted. There are charitable games, but they don't include poker, only bingo and raffles. Before you shake your head in dismay, however, we're here to tell you that there are about 30 commercial casinos along with a handful of tribal gaming locales with about a dozen cardrooms and several brick-and-mortar sportsbooks for you to choose from. The Horseshoe Tunica is the largest live poker destination in-state with 25 tables offering $1/$3 NL and $4/$8 Limit Hold'em just about every day. PLO and Hold'em for larger stakes run every once in a while. There are low-buyin tournaments throughout the week, including a $10,000 guaranteed event Saturdays for a buyin of $125 + $25. If licensed online poker were to be added to the gambling menu in Mississippi, then we foresee Caesars Interactive and MGM International starting up sites. These brands have casino properties in the state, and they're also experienced in the internet poker realm. Thus, these existing powers would be eager to leverage their experiences in both arenas, and we can expect them to be ready to go right out of the gate. Under the terms of a 2017 bill, sports betting is legally regulated in Mississippi, subject to the rules established by the Mississippi Gaming Commission. However, the federal ban on this type of wagering meant that this state law was held in suspension. In May 2018, though, the U.S. Supreme Court struck down the blanket ban on states hosting their own sports betting economies. The Mississippi Gaming Commission swung into gear and quickly issued the relevant guidelines for casinos in the state to open their own sportsbooks. In addition, offshore bookies serve USA residents, including Mississippians, while remaining largely beyond the reach of the U.S. government authorities. The first legally supervised sportsbooks to open up in the Magnolia state were at the Beau Rivage in Biloxi and the Gold Strike in Tunica. Both are operated by MGM Resorts and began accepting wagers on sporting events Aug. 1, 2018. Other venues, like Sam's Town in Tunica and Harrah's Gulf Coast in Biloxi, are expected to join the market shortly. There are a few restrictions on Mississippi-regulated sportsbooks. The most notable among them is the fact that you must be physically present at a licensed location to book a bet. This means no wagering from the comfort of your own residence. For a state with such a lengthy history of betting, Mississippi hasn't really produced very many poker players of note. Perhaps the most famous is “Captain” Tom Franklin. Although born in Fresno, CA, in 1950, he now calls Gulfport, MS, home. He began playing poker in the 1970s and has amassed more than $3 million in live tournament winnings. Tom has achieved an impressive 84 cashes at the World Series of Poker as of November 2017, including a bracelet in the 1999 Limit Omaha $2,500 buyin event. Online poker in Mississippi is ready for you to enjoy when you want to play without having to leave your house. The law won't persecute you in any way for this hobby, so select a Mississippi online poker site and get ready to play today. As you hone your skills, you can look forward to collecting a decent profit, which will be delivered straight into your hands whenever you want. If you're fortunate enough to have another address in a nearby state, be it your business address, vacation getaway, second apartment, family home, etc., you may have other online poker options available to you. 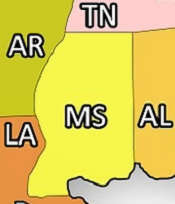 Here is a list of the states that border Mississippi and Professional Rakeback's review on each of them: Alabama, Arkansas, Florida, Louisiana, and Tennessee. For a broader perspective on the landscape for internet poker in the country as a whole, including states other than those listed above, our U.S.A. poker guide may be worth a read through. 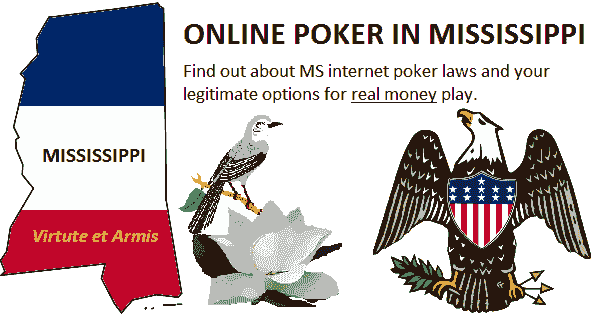 Many people in Mississippi are ignorant of the possibility of playing poker online from the Magnolia State. You can do something to enlighten them by sharing this page with anyone among your friends and family who's enthusiastic about poker and would like to play over the internet. Sometimes you just want answers to the burning questions on your mind without having to wade through a lot of extraneous data. We've collected answers to some of the most common queries regarding online poker in Mississippi and have presented them below. Is Online Poker Regulated by the State of Mississippi? No, it's not. There have been attempts, starting in 2012, to institute a legalized regulatory structure for internet poker in Mississippi. However, all of these legislative pushes by State Representative Bobby Moak haven't borne any fruit. Nevada, New Jersey, Delaware, and Pennsylvania are the only four states to have established the necessary licensing regimes for online poker, and Mississippi hasn't yet joined them. This failure has allowed offshore sites into the picture, and they're all too happy to serve MS poker players. They're fully licensed and legal in the jurisdictions in which they're incorporated, like Costa Rica and Antigua, so you can feel secure when you take a seat at their tables. Is Online Poker Legal in Mississippi for Real Money? Yes. There's nothing federally prohibiting you from playing online, and Mississippi itself has never brought legal action against those who play cards from their own computers. The few laws that do relate to online poker criminalize those who actually manage the games, not those who play in them. Don't believe what you might have seen in the mainstream media – most non-industry sources are pretty clueless when it comes to online poker law. Is PokerStars Legal in Mississippi? It's completely legal for you to play at PokerStars from within the borders of Mississippi. Unfortunately, this is a moot point because the company doesn't accept customers from the state. You see, as part of its settlement with the Department of Justice in 2011, related to the Black Friday indictments, Stars agreed to stop serving the United States except in state-supervised online poker markets. It's not just Mississippians but all residents of the U.S., apart from New Jersey, who are unable to sign up for accounts at PokerStars. Even if a regulated MS internet poker economy was eventually developed, it's possible that competitors might use PokerStars' willingness to cater to Americans from 2007 - 2011 as ammunition against it. This is what happened in Nevada where “bad actor” clauses were inserted into the online poker enabling legislation. Basically, they're continuing to punish PokerStars through legislative actions beyond what was stipulated in the terms of the deal reached with the federal government. This is a sad state of affairs, but it's only to be expected when big money and large corporations get involved. Is Ignition Casino Legal in Mississippi? Yes. Ignition Casino is not based in the United States but rather in an offshore location. It's part of the PaiWangLuo Network, which is incorporated in Hong Kong and complies with the laws of that region. While the U.S. authorities aren't exactly pleased by the fact that Americans can do what they want with their money at Ignition and other virtual poker rooms, the World Trade Organization has ruled against U.S. anti-online gambling strictures time and again. It's based on their understanding of these judgments and other international laws that Ignition continues to offer card games in the States. Is BetOnline Legal in Mississippi? Is the Global Poker internet poker site legal in Mississippi? Global Poker argues that U.S. sweepstakes law allows it to operate legally in Mississippi, but we harbor certain doubts. There isn't enough space to fully explain the reasons why in this FAQ, but you can consult our Global Poker review for a thorough discussion of this and other matters related to Global. What's the Minimum Gambling Age in Mississippi? You must be at least 21 years of age to place a bet in a live casino in Mississippi and at least 18 if you wish to partake in charitable bingo. Online, it's 21 that applies. Because online gaming doesn't fall within the jurisdiction of the MS authorities, the firms that offer it must fall back on international rules when determining how old someone must be before using their services. This means that as long as you've passed the age of majority in your country or state, you're good to go at any online gambling destination. The age of majority in Mississippi is 21, so you must be 21+ to gamble online. Some sites may allow you to play even if you're younger than 21, as long as you're over 18, but this is because they can't really keep up with the various age of majority guidelines in thousands of locations around the globe. In most cases, the terms and conditions of the sites specify that it's your responsibility to verify the age of majority where you live and obey it. We encourage you to scrupulously follow the rules of whichever internet sites you gamble at so that you don't encounter any problems later on. Can I Start My Own Online Poker or Gambling Business in Mississippi? No, that would not be wise. All the existing online poker and gambling sites are headquartered elsewhere, like the Isle of Man and Malta, where such business is legal and licensed. As an individual in Mississippi, if you were to try to open up your own internet poker, casino, sports, or other gambling company, you'd be subject to the laws of Mississippi and the United States, which penalize this behavior severely. How Do I Make Deposits and Withdrawals for Mississippi Online Poker? The easiest way to proceed is by transacting in the digital crypto-currency Bitcoin. It's fast, has low fees, and preserves a high degree of anonymity for you. All of the sites we work with allow customers to make BTC transactions. There are other methods of payment processing available, like credit cards, bank wires, and debit cards, but they sometimes involve considerable delays and irritating surcharges. Another up and coming cryptocurrency, Ethereum, is seeing wide adoption at online poker sites as it generally has faster transaction times and cheaper fees than Bitcoin. If you are unfamiliar with Ethereum or using Ether to gamble online, we have a comprehensive Ethereum gambling and poker guide that should answer all of your questions. Do I Have to Pay Taxes on My Poker Winnings? The U.S. federal and Mississippi state governments definitely want their cut of any profits you make at the online tables. The poker operators aren't in league with the taxing authorities, however, and so the entire responsibility of ensuring that you're in compliance with tax laws rests with you. There are several different ways to file your returns, depending on if you're a pro or a recreational user, a winner or a loser, et cetera, and we're not in a position to give you any advice on this matter. Talk to a tax professional if you want to know how playing poker will impact your tax liability. Can I Play Online Poker on My Mac?? It used to be the case that there were only a few poker rooms that supported Macs, but the number of Mac poker clients available has increased in recent years. Ignition, Sportsbetting.ag, and 5Dimes are some of the Mississippi online poker firms that have designed and deployed native Mac download clients. At other sites, you might be able to run Windows poker software from your Mac via emulation programs, like Parallels. Can I Play Online Poker on My Mobile Device? Mobile gaming is growing rapidly, and internet poker entities have not been slow to adjust. There are plenty of them that allow customers to play cards from their tablets and smartphones. Ignition, Sportsbetting.ag, and the Winning Poker Network all permit you to compete at the tables through your smart device. In some cases, though, the choice of games available to you through these apps is restricted. What Is Mississippi Stud? Is It a Poker Variant? Mississippi Stud is a casino table game, not a multi-player form of poker. It is based upon stud poker though. The way it works is that each player antes and is dealt two cards. Then, three community cards are placed facedown in the middle of the table. Before each community card is turned over, each player may fold or make a bet of any amount between 1x and 3x the ante. Then the next community card is revealed. There are thus three additional opportunities during each hand to increase the stakes. After the final middle card is shown, the players collect winnings based upon the final strength of their five-card poker hands. A pair of 6s, 7s, 8s, 9s, or Ts pushes while the minimum winning hand is a pair of Js, which rewards the player 1:1. The highest winning hand is a royal flush, which pays 500:1. Hands worse than 66 lose. The house edge on the initial wager is 4.91%: not especially good for a table game. However, because there's frequent raising in this game, the more appropriate figure to use is the element of risk, which is 1.37%: not bad at all. This does depend, of course, on learning and following the correct strategy. What Is a Mississippi Straddle? A Mississippi Straddle is a type of blind bet placed preflop equal to two times the big blind. It's completely voluntary to place a Mississippi Straddle; no one is ever forced to do it. Unlike a regular straddle, the Mississippi Straddle can be placed from any position at the table, not just under the gun. In most cases, the Mississippi Straddle overrides the normal flow of the action, and the person to the left of the straddle must go first preflop. This means that the straddle acts last, and if there has not yet been a raise, he or she can check or raise just as the big blind would in a normal round of preflop poker. In a few card rooms, the action starts under the gun like normal, but it skips over the person with the Mississippi Straddle, only returning back to that individual after all others have acted.